is maybe the most cosmopolitical village on Samos due to its famous yacht harbour. In summertime you will find here yachts from all over the world and in all sizes. You can enjoy the view sitting in a bar at the 2500 year old port or have a swim at the surrounding beaches, three of which are awarded with the blue flag of the european union. Pythagorio offers a lot of nightlife with its bars and nightclubs and of course shops and tavernas for any taste. 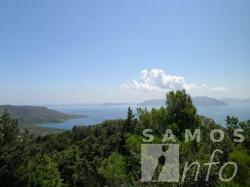 Many of Samos' 4- and the only 5-star hotel are located in this area. Only a few kilometers away from Pythagorio, Potokaki offers a completely different kind of holidays. If you enjoy swimming or just relax on a sheer endless beach of sand and small pebbles this is the place for you. However, Potokaki is still close enough to the major sights like the Eupalinos tunnel or the ancient Heraion. is the capital of the island and the district (Nomarchia) of Samos that includes the islands of Ikaria and Fourni as well. It has around 8000 inhabitants. The right choice if you want to travel around by bus. All major lines end here. Also for those who want to feel the real greek life this is a good place to be. Most hotels are outside of town, offering a relaxed atmosphere, yet you can easily reach the town with all its shops, cafes and tavernas where the local populations goes. is a full featured touristic village. Yet it has kept a lot of its original atmosphere as a fishing village and is thus unique in the east aegean. You will find night clubs, bars, restaurants of any kind as well as shops and rentals. 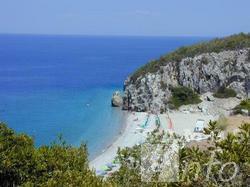 Moreover, Kokkari is an ideal starting point for walks in the mountains and a famous windsurfing resort. Around Kokkari there are many bays with nice beaches in a grand landscape. Kokkari is highly appreciated by those who love the original atmosphere but don't want to miss on the touristic infrastructure. Situated at the end of a road in the central south of Samos, Ireon has become renowned for its family friendly atmosphere. There is a nice, long beach ideal for children, there is not much traffic, altogether it is a serene place surrounded by mountains and the sea. There is a bus going a few times a day and there are shops, rentals and restaurants. And let's mot forget the famous ancient temple of Hera that gave the name to the village and is in walking distance. In Ireon you will find small, familiar pensions rather than bigger hotels. 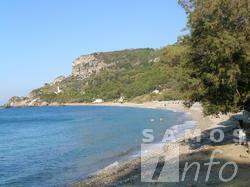 This is the "newest" touristic area on Samos situated in the south west of Samos. It is situated on a long, sandy beach. While Ormos is the port of Marathokambos for many years, Kambos/Votsalakia consist of shops, tavernas, pensions and hotels, offering anything that you would need to spend relaxing holidays in a grand landscape. ideal for families with children as well. Right behind Kambos the Kerkis mountains, with over 1400 meters the second highest in the Aegean, offer a breathtaking view. West of Kambos the "Wild West" of Samos begins, some small villages up in the mountains, almost completely unspoiled by tourism. Paleo (old) Karlovassi lies on a hill above the town and offers picturesque views and a lot of tranquility. Meseo (middle) Karlovassi used to be the industrial centre of Samos until the 30th of last century. Today it hosts the harbour and offers a kilometers long pebble beach as well as hotels, bars, restaurants and shops. In Neo (new) Karlovassi the everyday live takes place; this is where most people live, it features the aegean university for mathematics and informatics, a hospital and any kind of shops for the needs of the inhabitants. Outside of Karlovassi there is the bay of Potami close to the famous springs, a beautiful place to swim and relax. Situated on the northwest coast of Samos, Karlovassi is a good starting point to explore the beautiful green mountains of both mountain regions of Samos, Kerkis and Ampelos. Starting point of all bus lines connecting the western villages. Being an old fishing village, Agios Konstantinos is hardly discovered by tourists. However, it has become the holiday home for more and more nature lovers who enjoy the absolutely original atmosphere and the fabulous green surroundings. There are only a few small hotels and pensions guaranteeing for unspoiled and quiet holidays. Situated on the road Karlovassi-Samos there are frequent bus connections in summertime.